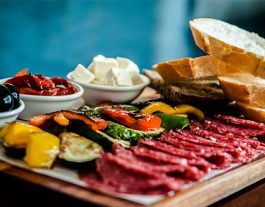 Home / Eat / Category "Restaurant Reviews"
La maison Deli has a great outdoor setting with drinks a cut above usual cafes. 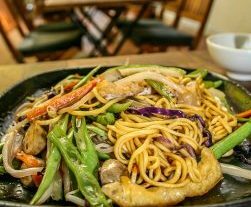 Vietnamese, Korean, Japanese, Thai and European cuisine options. 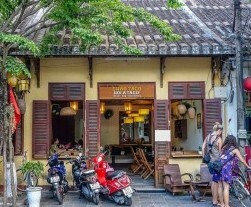 One of the best culinary journeys in Hoi An. 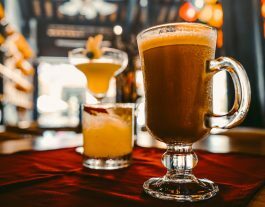 Superb cocktails, diverse settings, divine food, great wine list and the Hoi An Cigar Club! 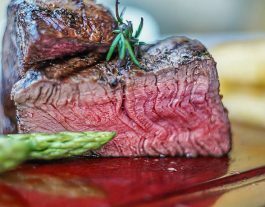 There are those times, as every dedicated carnivore knows, when nothing, absolutely nothing else can substitute for a big fat juicy steak, marinating in its own juices, seared to perfection, sizzling on a bed of creamy mash …. Oh stop it! My extremely healthy quinoa and tofu salad has just lost all it’s appeal! Hoi An Steakhouse bring it on! 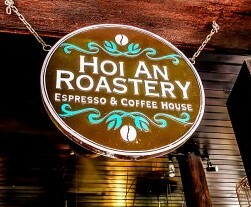 There is certainly no shortage of coffee shops and bars in Hoi An. 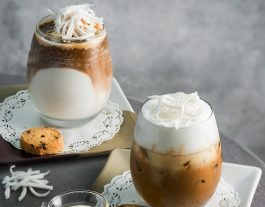 But few places cater to your beverage needs with as much attention-to-detail and sophistication as new kid on the block, Pure Coffee. 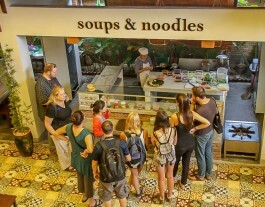 Solid cheap meals come quickly and without ceremony at Cafe 41, fast food Vietnam style. 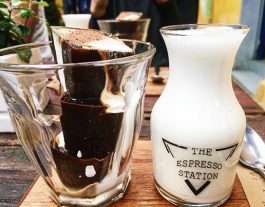 Neighbour, Cafe 43, pulls more customers yet Cafe 41’s prices and quality are comparable, it’s seating more comfortable, and its staff friendlier. Perhaps the more sedate indoor feel is the deterrent but for us there’s not much between these two very cheap Vietnamese restaurants. 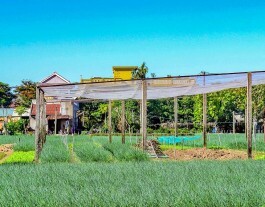 Baby Mustard sits idyllically by Tra Que’s market gardens in a backstreet off the road to An Bang Beach. 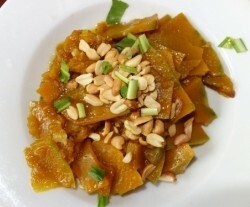 It rates very highly on peer review sites and seems to have struck upon a menu and cooking style that brings Vietnamese food closer to Western palates. Above-average and mid-priced but look out for the mozzies! 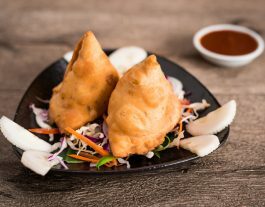 Baba’s Kitchen is the best Indian restaurant in town for many. 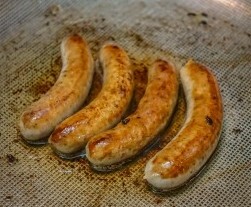 Their food has a genuine kick of original flavor and it’s not dumbed down. With over two million tourists crawling over Hoi An every year, it’s pretty hectic in the Old Town, especially early evening. Indeed, many locals have given it away as a comfortable destination. So, where are the fine-dining alternatives away from the common throng? 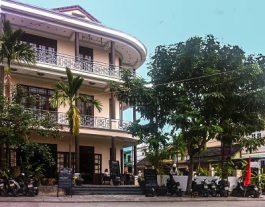 Housed in an old colonial building on the edge of Hoi An’s Old Town is Thai Market Restaurant serving authentic Thai food at great prices. 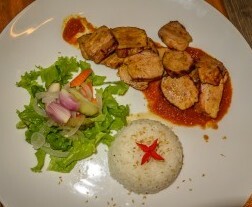 Nhan’s Kitchen serves Italian-style food, sandwiches and burgers alongside Vietnamese standards very cheaply. Popular with first-class customer service. 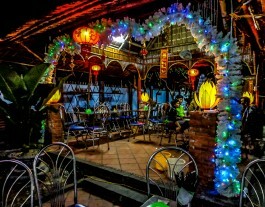 Home Hoi An Restaurant has been developed by skillful managers who have a deep understanding of the preparation and presentation of traditional Vietnamese food and inherent good taste. 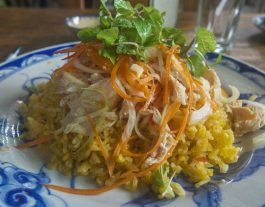 While the prime clientele are overseas visitors, all diners leave not just with a great meal experience but also a much-expanded understanding of authentic Vietnamese cooking and style. Rosie’s Café on Nguyen Thi Minh Khai Street, just up the alley from Nu Eatery, is a delightful marriage of Vietnamese coffee tradition and modern aesthetics. 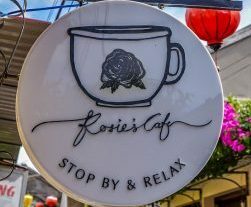 Rosie’s offers a wide selection of coffee beverages and fresh juices along with a calm, cool space to have a chat, read, or work. 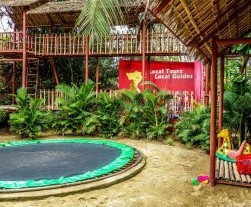 For an authentic Vietnamese dining experience in a relaxed garden setting, Hoi An’s Ba Le Well restaurant is not to be missed. 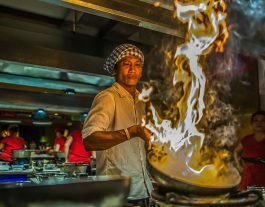 You feel more like a family guest than a customer, and if you play your cards right, you might even get a big hug from Ba Le owner, Ms Be, as you leave. At Orivy the tranquil, shaded garden skirted by calming ponds keeps me coming back more than anything. 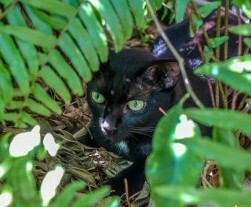 It’s a lush oasis amidst the concrete and brick of nearby neighbors; a portal that transports one away from stark urbanity. 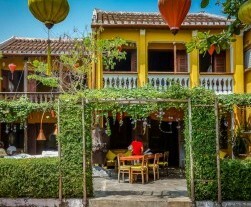 There’s nothing else like Belleville Restaurant & Lounge in Hoi An. 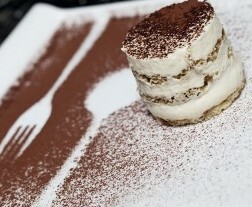 Fine food, live music, bohemian atmosphere, great location. 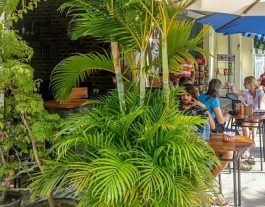 Annen’s laidback style invites you to relax as you enjoy fresh, Vietnamese, vegetarian cuisine at some of the cheapest prices in Hoi An. 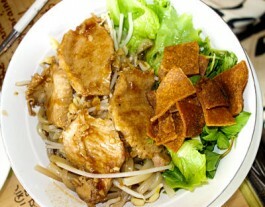 Nu Eatery is one of the best value-for-money eateries in town. 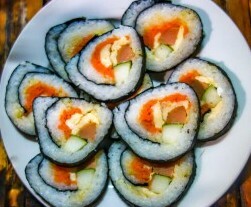 And it’s ‘Asian Fusion’ style, characterized by a light touch, is refreshingly original too. Do you need more than a quality cup of coffee? Are you seeking décor and ambience to enhance your caffeine hit, that certain je ne sais quoi? Over 200 coffee varieties on offer, coffee workshops and coffee beans roasted on the premises. 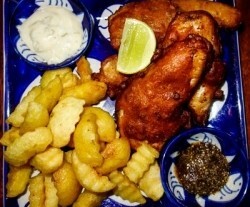 The Mexican cuisine at Hola Taco is in the top rung, value-wise, of any Mexican restaurant I’ve tried. 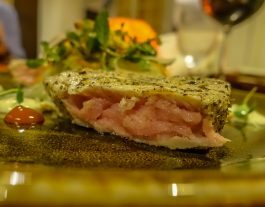 Fully deserving its high rating on TripAdvisor and a favorite with expats, the freshness of the ingredients, along with some individual flair, is its key to success. 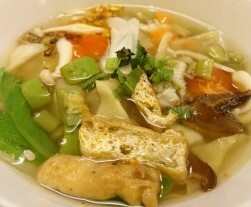 Leading vegetarian restaurant, Minh Hien 2, is a kissing cousin of the original Minh Hien on Tran Cao Van. Now, Minh Hien 3’s garden setting has been added to the Minh Hien success story proving good quality at good prices is a winning formula. Does size matter to you? When it comes to coffee, it does to me. The Espresso Station serves up a huge double-shot coffee at very reasonable prices – and that’s enough to tempt me back. There’s a rather relaxing oasis vibe to this place. ‘Don’t get me wrong, I love Vietnamese food. But sometimes you just have to have a chip butty’, quipped amenable larrikin Brit, Tim. 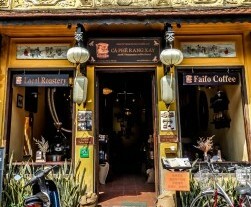 Put simply, Faifo Coffee has the best coffee in Hoi An. It is piping hot, strong and full of flavour and I cannot recommend it enough. Faifo Coffee is housed in a sympathetically renovated building in the Old Town with a great street view upstairs.. 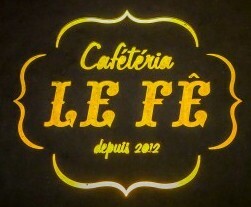 I stop regularly at Le Fe Cafétéria for a drink in peace and quiet in this great little hideaway. 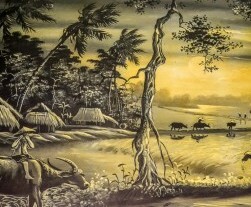 Bohemian setting with American jazz motifs scattered around. 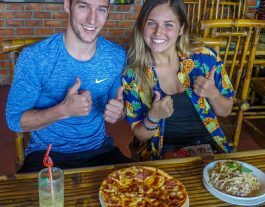 Late in 2015 Jim’s Snackbar opened in Hoi An to universal acclaim. 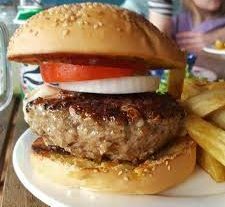 Immediately, the expat grapevine buzzed with rumors that the best burgers and hot dogs in the world had arrived on our doorstep. 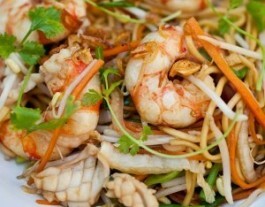 Mango Mango is the second of celebrity chef Duc Tran’s three Hoi An restaurants. Fusion Cuisine. 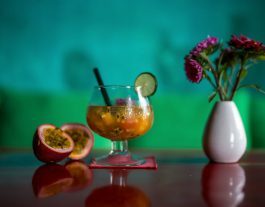 Great Cocktails. 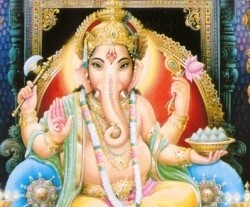 Walking into Am Vegetarian Restaurant is like walking into a Buddhist monastery. 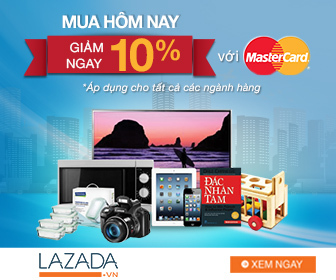 The food is outstanding and, with mains around 60,000 VND, as cheap as a cup of coffee elsewhere. Famously, Anthony Bourdain celebrated Banh Mi Phuong on television and it hasn’t looked back since. 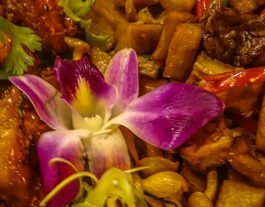 Karma Waters is a dedicated vegan restaurant. 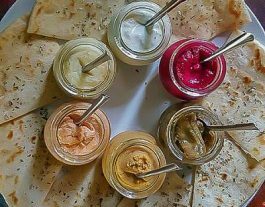 Some non-vegans may find it a little bland while for others it’s a godsend that can be trusted with only pure, vegan organic ingredients. Korean restaurant, Banh Trang Tron, is cheaper-than-chips and one of the best value-for-money options in Hoi An. 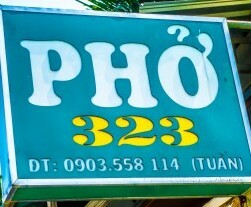 Packed every morning with locals and the odd expat in the know, Pho 323 serves one of the best phos (pronounced ‘fur’) in Hoi An. 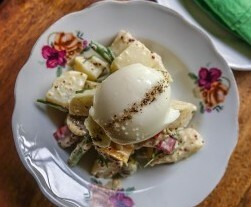 The Little Menu is French café style in a 100-year-old house on Le Loi. 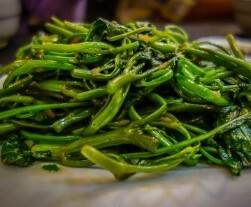 Ganesh’s delicious dishes consistently satiate both Hoi An’s tourist and expat populations and local chefs are often spotted sampling its fine offerings. 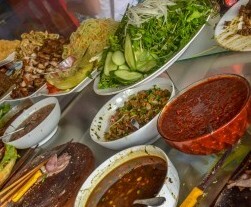 Hoi An Food Safari runs an exceptional, personalized food tour in Hoi An with a particular emphasis on street food. 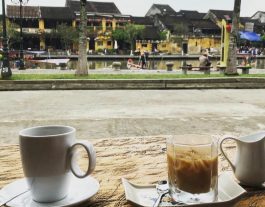 A few minutes’ walk across the Lantern Bridge from the Old Town on An Hoi, No 11 is a chilled place to observe the hustle and bustle nearby from a peaceful distance. 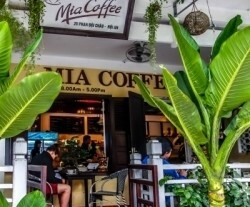 Away from the hustle and bustle of the main tourist drag, Mia Coffee with its beautiful wrap around veranda surrounded by jungle-greenery is a premier meeting place for ex-pats and tourists in Hoi An. 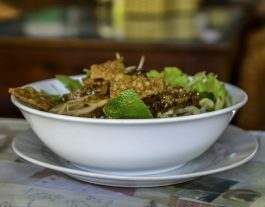 Hoi An’s Minh Hien Vegetarian Restaurant and its 2 sibling venues are some of the best value food venues going. 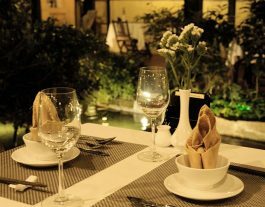 The Secret Garden’s glorious French-colonial, garden setting makes this hidden gem one of the prettiest places to dine in Hoi An. Fusion style. 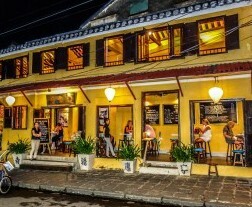 On the prime Old Town corner of Nguyen Thai Hoc and Le Loi, White Marble Bar, Hoi An’s first fully-fledged wine bar, is a popular meeting place for expats and tourists. 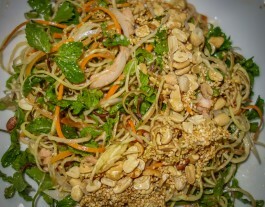 Mai Fish offers outstanding traditional Vietnamese cuisine in Hoi An. 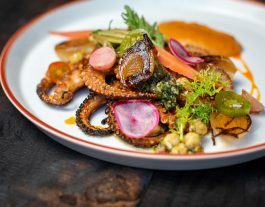 It’s a celebration of local home cooking in a verdant courtyard. 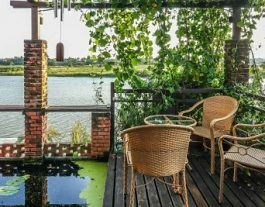 Hoi An’s celebrated Mango Rooms has earned international renown; expect imaginative combinations from celebrity chef, Duc Tran. 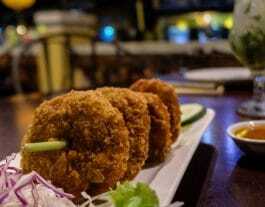 Loved by Hoi An expats Chips ‘n’ Fish ‘n’ Stuff is a value-for-money spot with a hit of battered fish, just like home, but better. 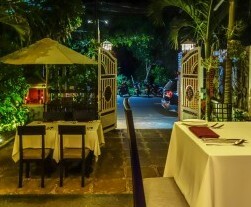 L’aubergine 49 is arguably Hoi An’s leading International restaurant.